When it comes to growing in your relationship with Jesus, there are three things that have been proven consistently to take you deeper. The first element is to realize that you’re broken and you will fall. What you do after that will determine whether or not you will grow in it. Consistent Jesus followers fall but then make the decision to get back up and take the next step forward. They don’t return to their former ways of life but instead choose to move ahead. It’s inevitable: you’re gonna sin. You’re gonna fall. Make the choice to get up, ask God for forgiveness and take the next step. This week, I want to give you the second element you need in your life if you want more from your faith. Everyone is busy. 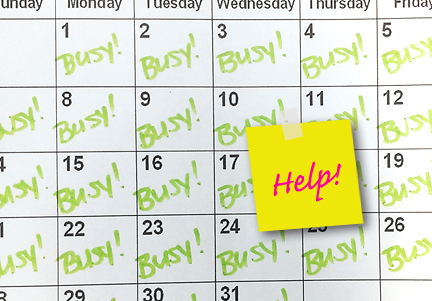 The question is: what are you going to busy with? 2. Make time for Jesus and with Jesus. When you value a relationship with someone, you prioritize that relationship so that you spend time with the person often. A friendship will not grow when there is no time invested. A marriage will not grow when there is no intentional effort devoted to it. Your relationship with Jesus is no different. If you want it to grow, you have to both make time for Him and make time with Him. There always seems to be much confusion about how to develop the discipline of spending time with God. What I’ve learned in my years is not original with me but it has consistently lead many people to deeper relationships with Him. Simply put, you need a time, a place and a plan. When it comes to spending time with God, you need to prioritize the time so much so that you put it on your calendar. Our kids’ sporting events, recitals and hobbies are on our calendars because they are important to us. Schedule a consistent time alone so that you can get together with God often. Pick the time of day when you will be at your best, undistracted and focused. Most people recommend first thing in the morning so you can start your day off with Christ at the top so everything else in your day runs through Him. Take 10-20 minutes and set it aside just to be with God. During those scheduled times with God, you need to have a consistent place where you can go and focus. Make this a consistent place where the distractions are limited and you can pray and talk to God, read His Word and sing if you choose without getting strange stares from people passing by. This can be on your patio, in a specific chair, or at the breakfast table. Simply make sure that it’s a place where you can spend the 10-20 minutes alone and undistracted. Leaving the television or radio on or keeping Facebook open while you are spending time with God will not allow you to stay focused. Wherever it is for you, find a consistent place and let that be yours. So what do you do in those 10-20 minutes each morning on your patio? You need a plan. There are a bazillion different great devotional plans out there. The YouVersion App has many bible plans that include taking you through the bible in a year, covering Jesus’ journeys in the Gospels, and focusing on the biblical discipline of prayer. There are also many devotion books that can serve as a spring board to you get in to the Word. Beyond the devotion articles, consider reading through a book of the bible. If you are new to bible reading, the gospel of John is a great place to start in order to get to know Jesus. Whatever you do, have a plan to get in to the Word and stay in it consistently. If you have an important relationship in your life you prioritize that relationship so that it can be nurtured and fed. The same is true in your journey with Jesus. Make it a priority so you can grow and become who God wants you to be. A time, a place, and a plan is the second step to more.